Art, music and fashion serve as inspirations for the new Radisson RED lifestyle select brand developed by the Carlson Rezidor Hotel Group, which opened its first U.S. location in Minneapolis in November 2016 as the brand’s first new build and prototype design. 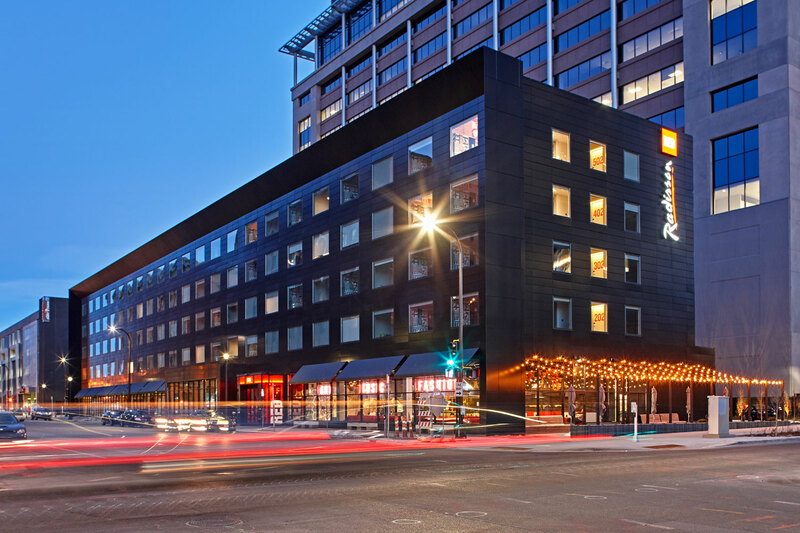 The Radisson RED Minneapolis – a 90,010 square-foot five-story 164-room hotel – is located in the city’s East Town neighborhood and within walking distance of the new U.S. Bank Stadium. With no front desk, guests can check in to the Radisson RED with the swipe of an app, open keyless-entry doors to their rooms, and electronically chat with other guests. The Radisson RED brand is bold in design featuring red, black, white and gray interiors with art created right on the walls – sans frames. In the case of Radisson RED Minneapolis, local artist Adam Turman was hired to paint the local story of the “Murder of Crows” as a 128-foot by 13-foot hotel mural. An abstract frame for all of this art is included in the hotel’s exterior design, according to Wolf. 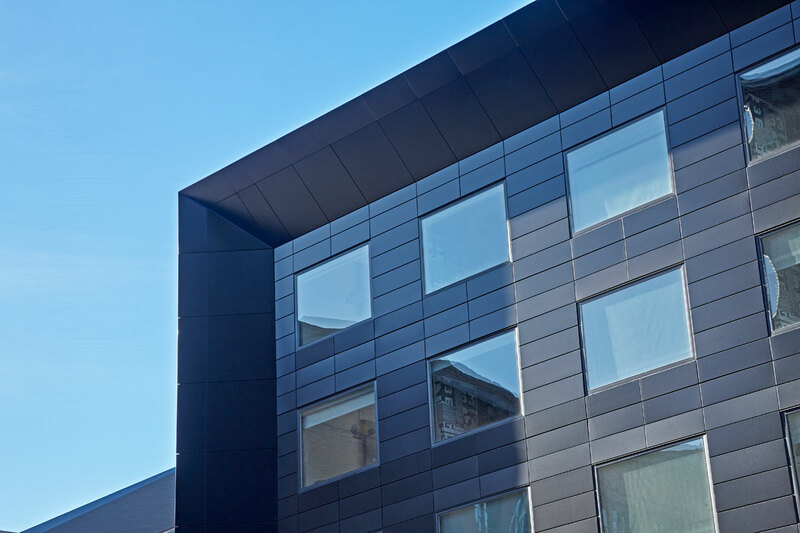 That signature frame element was created as part of the hotel’s façade, which is clad in 33,656 square feet of Alucobond® Plus aluminum composite material (ACM) by 3A Composites USA in the Focus Black color. 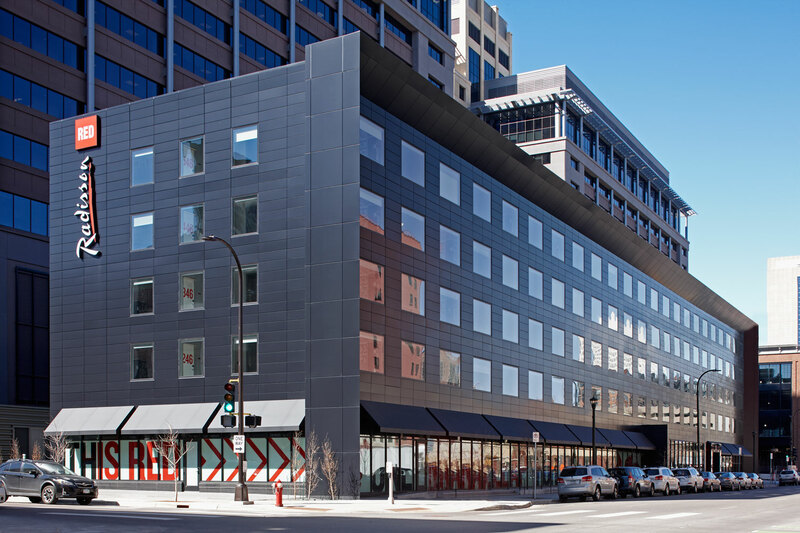 ESG Architecture & Design, of Minneapolis, served as architect of record for the Radisson RED Minneapolis project. And, Minneapolis-headquartered Ryan Companies US, Inc., served as general contractor. 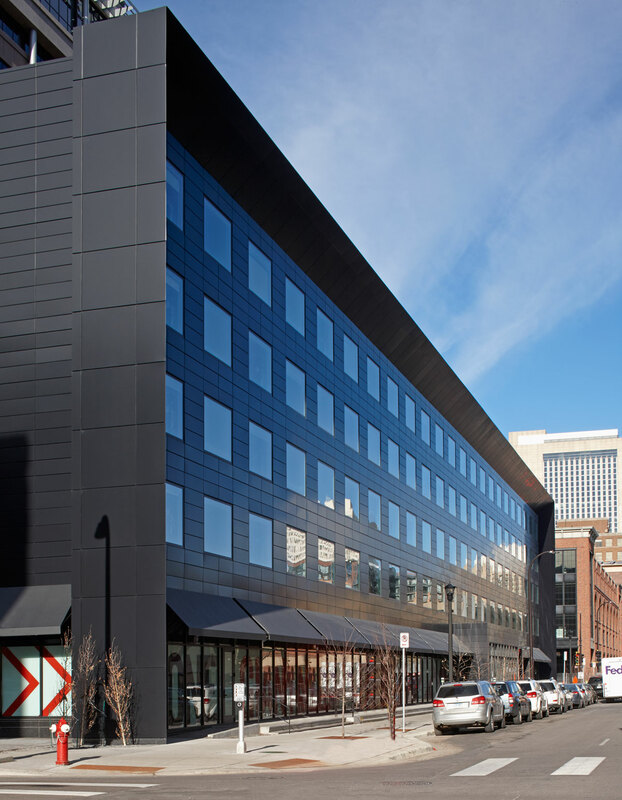 Metal panels were explored early on to clad the Radisson RED Minneapolis in order to present a “sleek, black surface,” according to Wolf. 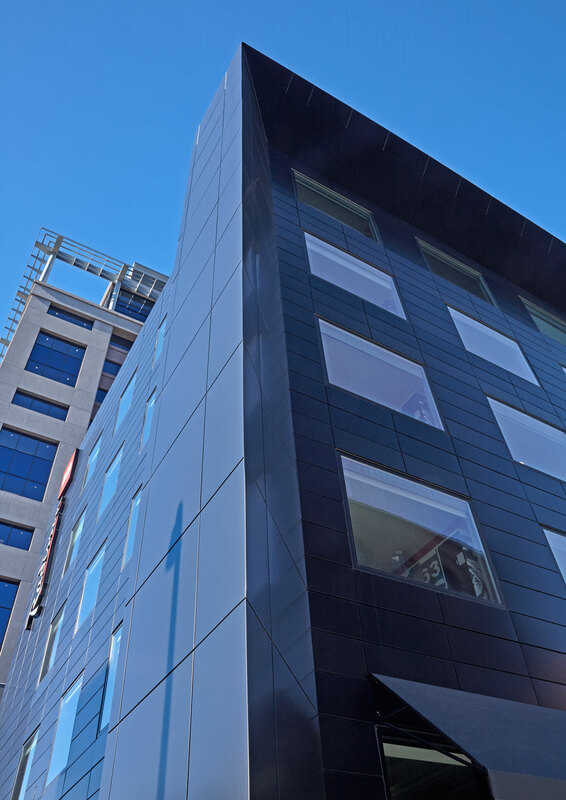 But, the reflective metal panels originally envisioned for the building’s triangular frame element – which encases the front of the hotel on three sides from the ground level up and above the building’s five stories – were quickly ruled out. Atomic Architectural Sheet Metal, Inc., of Vadnais Heights, Minn., fabricated and installed 33, 656 square feet of Alucobond Plus ACM, including approximately 4,500 1-foot-4-inch by 4-foot panels. 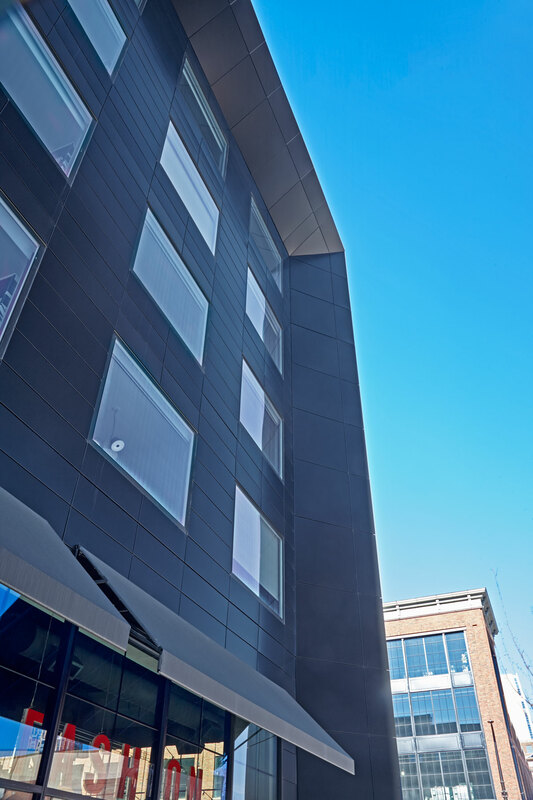 The Alucobond was installed with Atomic’s dry-joint rainscreen system. ESG worked closely with Carlson in executing the hotel’s design in order to “iron out the important decisions that any hotel brand must make when it is rolling out a new prototype,” said Gruenhagen. 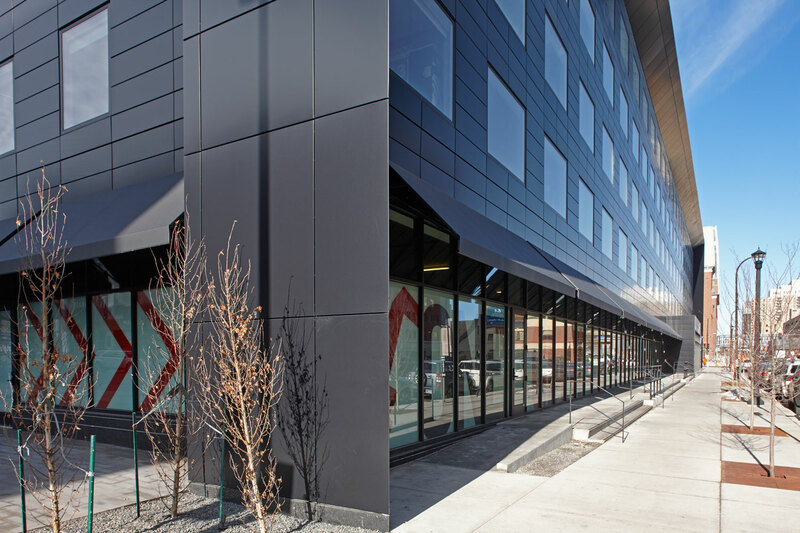 With its close proximity to the U.S. Bank Stadium – which is slated to host the Super Bowl in 2018 – the Radisson RED Minneapolis’ design also was of great interest to city planning officials.